An absolute gem in Ballymena. No journey up North for us would be complete without a wee pit-stop at M'Town. N. Ireland Aeropress Champion in 2015 and with the friendliest service around, they are hard to beat! Their sweet selection is always stunning and we always grab a box for the road. When we first discovered Ursa Minor, we were hooked. There was something about this visionary husband and wife team that resonated with our hearts - Dara and Ciara welcomed us in on our first visit and the homely atmosphere has kept us returning ever since. Their passion and drive sees them going from strength to strength. The breads, sweet bakes and vegetarian savoury dishes that these guys create are incredible. GO and visit, seriously! 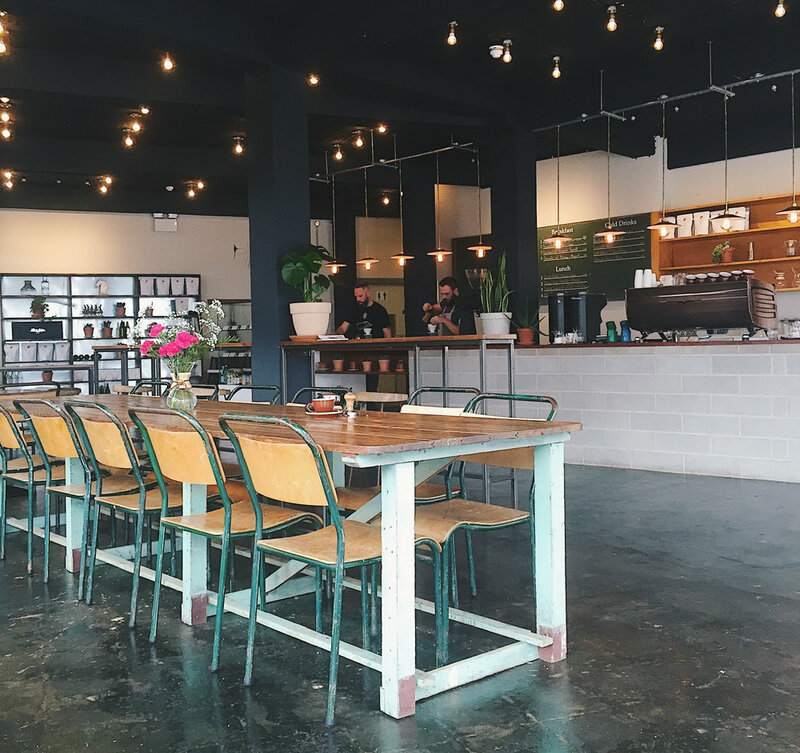 One of my all time favourites is L + F. Nestled in the heart of Coleraine is this wonderful little coffee hang. Excellent food and super coffee make it a must visit. They even won best cafe in Ireland this year at the Irish Restaurant Awards! For us, no North Coast adventure would be complete without a stop here. 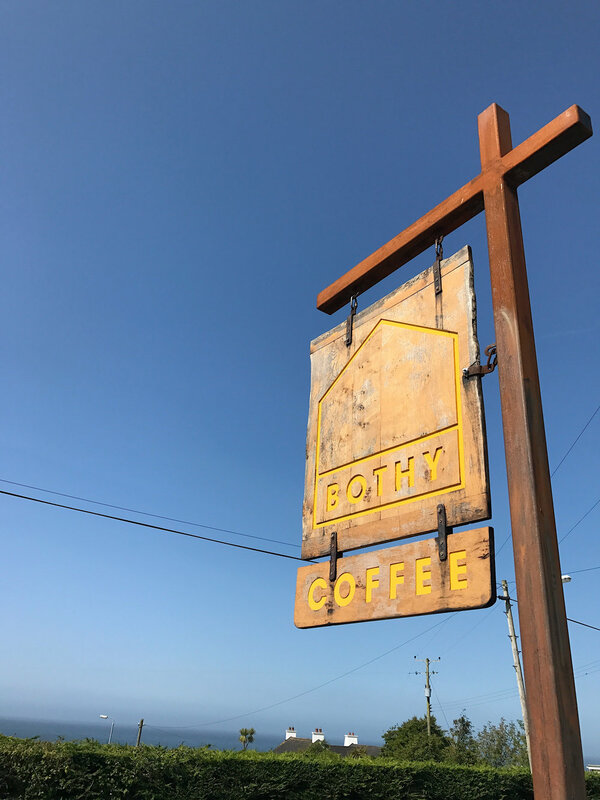 Next up ... a shelter and haven from those Atlantic gales ... is Bothy. I LOVE this place. In summer, you can sit outside (in the front porch or back garden) and enjoy the BBQ grill or pizza oven delights. In winter, you can cosy up and feel like you are home from home. If you do swing by Bothy, be sure to check out Ballintoy Harbour ( think Game of Thrones ) and White Park Bay too. A special place for us ( Matt and I shared our first kiss there!! ) and beautiful scenery as you make your way down to the gorgeous beach. Our last coffee hang up North goes to Babushka, who sits proudly on the South Pier of Portrush Harbour. It really is a prime location, facing the West Strand Beach. There's such a cosy and chilled vibe here, with great coffee and a homemade, locally sourced menu of goodness! Much like Belfast, if you're headed up North, there are some class places to coffee hang. These are, again, just some of our favourites at the moment. Feeling the North Coast pull? I think I am! Wherever you are drinking your coffee this week, hoping it's just how you like it! After much (and I mean MUCH) deliberation, planning, hmmm-ing and haaa-ing, my husband and I decided to take a greatly needed and well-earned break in Amsterdam … baby free. The initial thought of going away without my Phoebe made me feel a wave of mixed emotions (fear, guilt, excitement, more guilt, panic, more guilt with a bit more panic for good measure!) To say I was slightly apprehensive about leaving my wee woman behind would be an understatement. However, it is as important to note that alongside my panic, I equally felt the weight of the importance of purposely making time for just my husband and I. When a new baby comes along, life changes. The life you once knew instantaneously shifts and becomes centered around this new tiny human. They become your primary focus and the very reason that you breathe. You love them more than you can possibly even begin to describe. However, babies have a subtle way of zapping absolutely everything from you … your time, your emotions, what can sometimes feel like your whole and very being. This is amazing, totally amazing, yet it can be too easy to forget about the 2 very people who began the journey in the first place. The 2 very people that little baby relies on day and daily to provide unconditional love, support and care. So, Ma-ma and Da-da need to take a little time and look after themselves and to nurture their marriage. Re-discover a little love away from baby; marital love, not parental love. And this is exactly what we did. We strolled arm-in-arm round the whimsical, canal-lined streets of Amsterdam over the half term break. We explored fascinating museums hand-in-hand like teenagers. We drank copious amounts of coffee and ate far more than was good for us! But we never once stopped thinking about our darling daughter and smiled like silly kids whenever we received a photo or video from home. We really tried (and occasionally failed) to not feel guilty and enjoy our precious time together – just the 2 of us. In this post I guess I want to reassure you that it is OK to spend time away from baby. It is OK to focus on your marriage for a bit. I am certainly not advocating that you abandon ship and disappear for long periods of time. You chose to become a responsible parent after all! So, here is our little Amsterdam getaway; hopefully including some travel tips along the way for any of you thinking you’d fancy a stay here … it really is a beautiful city. We caught a flight from Dublin on a rather pleasant early Sunday afternoon, (Valentine’s Day in fact) and arrived in Schiphol Airport, Amsterdam around 4pm local time. Schiphol Airport is huge, with many popular and well known shops to browse in. Victoria’s Secret was one my husband was particularly interested in!!! Well, it was Valentine’s after all! Anyway, we didn’t take much time to browse as we quickly and easily booked our train ticket to Amsterdam Central Station using one of the many yellow ticket kiosks dotted around the Airport. It was a short and inexpensive train ride into the centre of Amsterdam where we exited through the doors of Central Station and onto the cold, wet and windy streets of Amsterdam. We headed straight across the tram lines to the information centre to buy our I-AMsterdam cards. These cards gained us free entry into many of the local attractions and free travel in most areas of the city - very handy for jumping on and off the many trams and buses. Using trusty Google Maps my husband was able to direct us to the right bus stop and bus to get us to our accommodation. I am totally fascinated by technology today; standing in the middle of a different country we could use our iPhone to plan any journey we needed to take and track the nearest bus or tram stop to us, when the next bus/tram would be arriving AND if it was running late etc! Incredible! We departed from Central Station and headed towards our next destination - the Boathouse. We explored AirBnb to find somewhere to stay in Amsterdam and came across the Boathouse. The cabin looked so welcoming and cosy that we just couldn’t resist. Staying on a local’s boat was a great way to experience Amsterdam and added such a feeling of authenticity and excitement to our visit. It was small yes, but what else do you expect when you are sleeping in the Captain’s Cabin? It was well equipped for all our needs with tea, coffee, fridge, toilet, super soft bed and warm shower each morning. The panoramic views of the surrounding harbour were beautiful and Eltjo was really helpful, welcoming and friendly. Check it out here and mention us if you are thinking of booking for a special discount! Eltjo couldn't believe just how little luggage we had. We travelled light (really light) on this trip. I have never ventured so far with so little! It is surprising just how much STUFF a baby needs (even just to go out to the shops!) So it felt great to travel with just the bare minimum, for once! The weather on Valentine’s Day was truly awful! The cold wind was fierce as we made our way along the exposed pier to get to the Boathouse. By the time we arrived we were soaked and more than ready for a hot cuppa. I remember thinking just how difficult the journey would have been with a little one in tow, particularly in the bad weather and was thankful we had made the decision to travel solo this time. The wet coats and boots were kicked off and we enjoyed a rest and a coffee before thinking about braving the elements again. Thankfully, the weather eased off a little to allow us to walk to the tram station where we boarded a tram headed for our Valentine’s evening meal. I researched a number of different places to eat in Amsterdam and came across Rotisserie Amsterdam - a Brooklynese Bar famous for its chicken. It was a quirky joint that was buzzing with locals. All our waiters spoke English and provided English menus. My G&T was the size of a fish-bowl and the chicken was incredibly delicious. Everything was perfect. We stuffed ourselves silly with succulent chicken and sweet, sweet apple sauce (a Dutch special) and left happy and oblivious to the weather that had got considerably worse since we arrived. Our journey back to the Boathouse was bitterly cold, windy and wet! Monday was planned to be a busy day, full of sightseeing, eating and exploring some of what Amsterdam has to offer. The weather was cold but sunny and I was so excited to discover! We began the day by taking a bus from Central Station 40 minutes out of Amsterdam to Zaanse Schans - a vibrant and stunning living and working community that dates back to the 18th and 19th centuries. It’s packed with wooden windmills, barns, houses and museums and built in the typically Dutch wooden architectural style. It is a stunningly beautiful place to visit. I loved simply walking around the unusual houses and working windmills. The place is so relaxing and it was completely fascinating to get to see inside these traditional windmills. The sights, sounds and smells were amazing. We also visited the brilliant clog workshop and scoffed sweet pancakes and hot chocolates. I was in my element. We travelled back into Amsterdam just after lunchtime where we took a pitstop in a trendy Starbucks just beside Central Station. Their menu choice was much more extensive than we have here in our Northern Irish Starbucks coffee shops and I very much enjoyed a Burnt Caramel Latte and doughnut. Our next plan of action was decided and we headed off to find the famous floating flower market, Bloemenmarkt. On route we passed through the famous Red Light District and several ‘Coffee Shops.’ We also stopped to admire the incredible Pathe Tuschinski Cinema. We stolled through the Bloemenmarkt and I resisted the temptation to fill my handbag with bulbs to bring home! I can just imagine how beautiful the Bloemenmarkt will be in a few months time, unfortunately we were just too early to see it in all its glory. Our next stop was to see Anne Frank’s house and grab some famous ‘Chips in a Cone’ on the way. We pre-planned to stop at Vlaamse Frites and wow - those chips were good! I chose to go for the good old traditional chip sauce and hubby went for (more) apple sauce with his. Delicious. We did indeed then visit Anne Frank’s house but the queue was just too long to wait to go inside. We had tried to pre-book tickets online but they only have a small number of tickets available for online purchase so you have got to get them early! Also, because our trip was so short, we were on a pretty strict time schedule and hubby wanted to see the Eye Film Museum before closing time so we hot-footed it back to Central Station and caught the ferry across to the IJPromenade. The Eye Institute building is beautiful and is full of interesting and interactive exhibits. We were wowed and inspired by Close-Up – A New Generation of Film and Video Artists in the Netherlands. I also had lots of fun making my very own movie - watch it here! We had dinner that evening in THT beside the Eye Museum. It is a tapas-style restaurant serving yummy tapas dishes from around the world and I would definitely recommend it, especially the pork and popcorn! Tuesday morning would be our last few hours in Amsterdam. We were due to head back to the Airport at 11.45 so we wanted to just enjoy a nice breakfast somewhere and explore another museum. We headed to the famous Museum Quarter and took in the wonderful paintings in the Van Gogh Museum before sitting in the sunshine sipping lattes and eating chocolate waffles, watching the ice-skaters in front of the Rijksmuseum and IAMsterdam letters. It was glorious. Overall, Amsterdam was amazing. It is a fascinatingly beautiful city with lots to explore and although we probably didn’t do most of the touristy, traditional ‘Amsterdam’ stuff, we had a flipping great time … and … it was ‘our’ time. Time to re-charge the batteries, re-focus on ‘just us’ and re-energise for the season ahead. Best of all though, we got to come home. Home to our beautiful baby. She didn’t seem to notice we’d been gone and had a fabulous time with her Nana and Papa (THANK YOU!!) She seemed more concerned with the awesome cuddly Miffy we brought her home!